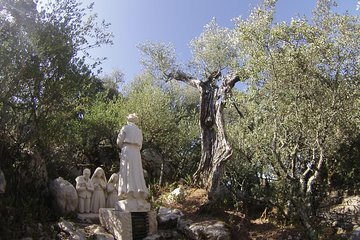 Scopri i luoghi sacri di Fatima in questo tour di 3 ore in piccoli gruppi guidato da una guida esperta. Addentrati nella storia di Fatima, vedi i suoi monumenti iconici e scopri la famosa apparizione della Vergine Maria. Vai al tuo ritmo e seleziona una partenza mattutina o pomeridiana. Questo tour per piccoli gruppi di pellegrini è limitato a 15 persone per garantire un'esperienza di qualità. Good but with disappointment. This 3-hour tour should start at 9 am as stated on viator's info and coupon. Got info from guide that he would arrive at 9:15 but actually picked us up at around 9:17 instead. Fine by us because we thought the tour would still be 3 hours. But no. Tour lasted less than 3 hours and we did not even visited the olive oil museum that was supposed to be included on tour stated on viator website. Guide was in a hurry but funny, friendly, and knowledgeable though. booked the Fatima Pilgrim Tour through your website 2 days ago, conducted by a local tour company. The tour was fantastic and my family thorough enjoyed the hospitality of Marco Gomes. It was my familys second day at Fatima and we have only visited the Sanctuary, as that was the only landmark familiar to us and it was walking distance from our hotel. Marcos came to pick us at our hotel promptly at 2pm, the arranged time. It was raining that day but that did not ruin our day. He came prepared with umbrellas and took us on a wonderful journey through his mini van. Marcos was highly knowledgeable and as a local. He first brought us to the 3 little shepherds residences where he explained the history and showed us their way of lives. As a local there, he gave an in depth explanation of the various apparition sites. Though it was supposed to be only a 2.5 hours tour, he extended the trip for us and even suggested to bring us to explore other parts. Though it was a cold and rainy day, Marcos showed us the warmth that Fatima espouses. We are truly grateful for the experience and we look forward to the many other trips hosted by him and his team.